Sierra Leone was the country most affected by the outbreak of the Ebola Virus Disease (EVD) with the highest transmission rates in West Africa. EVD not only put pressure on Sierra Leone’s medical facilities, including the loss of 7% of all health workers in the country, but it also revealed significant weaknesses in the country’s health system and infrastructure. These weaknesses persists today, over a year after the outbreak was declared over by the WHO. 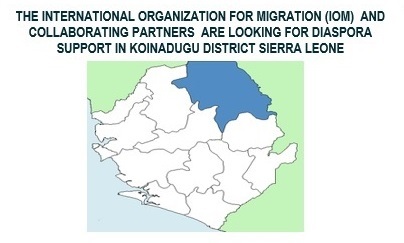 The objective of this project is to strengthen the Sierra Leonean health care system through the deployment of experienced diaspora health care professionals to Koinadugu district, one of the largest and least developed districts in the country, to support the delivery of quality health care to the population by building the capacity of local health workers. This project is funded by Japanese Government to enhance the Sierra Leone development. The Government of Japan has committed to its “Promoting resilient health systems for improved quality of life” to African countries, as one of three pillars of Sixth Tokyo International Conference on African Development (TICAD VI) which was held in Nairobi, Kenya in August 2016, and this project output can be attributed their commitment. 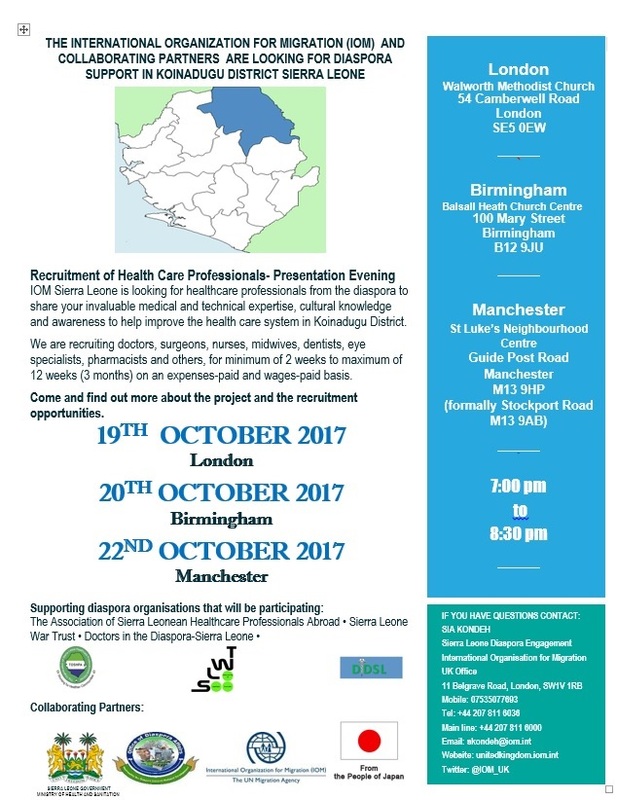 IOM UK will be supporting the implementation of the project by engaging Sierra Leonean health professionals who are based in the UK, informing them about the project and vacancy opportunities. Find out more by attending the roadshows on 19 October in London, 20 October in Birmingham and 22 October in Manchester.